Conservatives Of The Upstate: California Farmer Faces Bankruptcy For Failing To Give Feds Free Raisins? 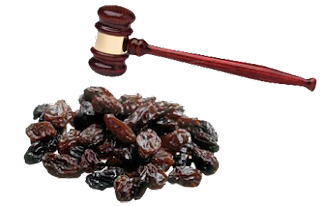 California Farmer Faces Bankruptcy For Failing To Give Feds Free Raisins? Marvin Horne, a California raisin farmer, is facing bankruptcy after failing to comply with a law that requires him to give the federal government a portion of his raisin crop ~ without compensation. Horne has been breaking the law for 11 straight years. He now owes the U.S. government at least $650,000 in unpaid fines. He also owes 1.2 million pounds of un-surrendered raisins – roughly equal to his entire harvest for four years. The Washington Post reports that Horne stopped giving raisins to the government in 2002, thereby violating Marketing Order 989 – the federal regulation that established "the raisin reserve" and made “contributions” by raisin farmers mandatory. After several losses in lower courts, Horne’s case reached the Supreme Court this past spring. The Supreme Court issued a ruling giving Horne a partial victory asking the lower courts to reconsider the case. Marvin Horne says that if he loses, it’s all over. Neighborhood Diversity? or Social Engineering? Common Core: Instruction or Indoctrination? An Op Ed: "Not Guilty"
Don't worry, it's not a fine … yet!